This city on the Clain River is in west central France, and is the capital of the Vienne Department. Originally called Limonum during the Roman conquests, it later took its name from the Gallic tribes who used it as their capitol; these were the Pictones, and the name evolved out of Limonum Pictonum. It was near Poitiers (Tours is often mentioned) that Charles Martel stopped the northern Islamic expansionism of the Muslims out of Spain in 732 AD, altering the course of European and Western civilization. He is singlehandedly credited with preserving Christianity and Western life in Europe. Charles, whose second name means “hammer,” a name given him for his ruthless slaughter of enemies (though there is some reference made to Judah Maccabee, who led a revolt against Greek occupation of Israel in 167 B.C.E. - Maccabee means “the hammer”). As a side note, The Maccabean revolt led to the Jewish holiday of Chanukah. Charles was a leading figure in the beginning of the Middle Ages, was credited with a seminal role in the development of feudalism and knighthood, and laid the groundwork for the Carolingian Empire, as he was the grandfather of Charlemagne. In the Middle Ages, famous figures from England's Black Prince and Richard the Lion-Hearted to Joan of Arc passed through Poitiers. 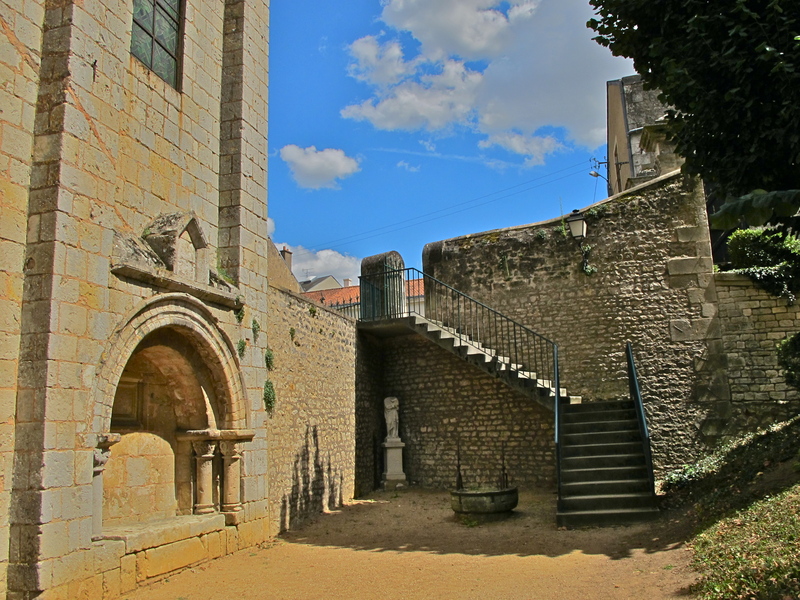 In the 12th century, Poitiers was the chief city of Eleanor of Aquitaine, who annulled her marriage to Louis VII so she could marry Henry II of England. In 1356, the Battle of Poitiers between the armies of Edward the Black Prince and King John of France was one of the three great English victories in the Hundred Years' War. As we view it today, most of the church dates from the 11th century. 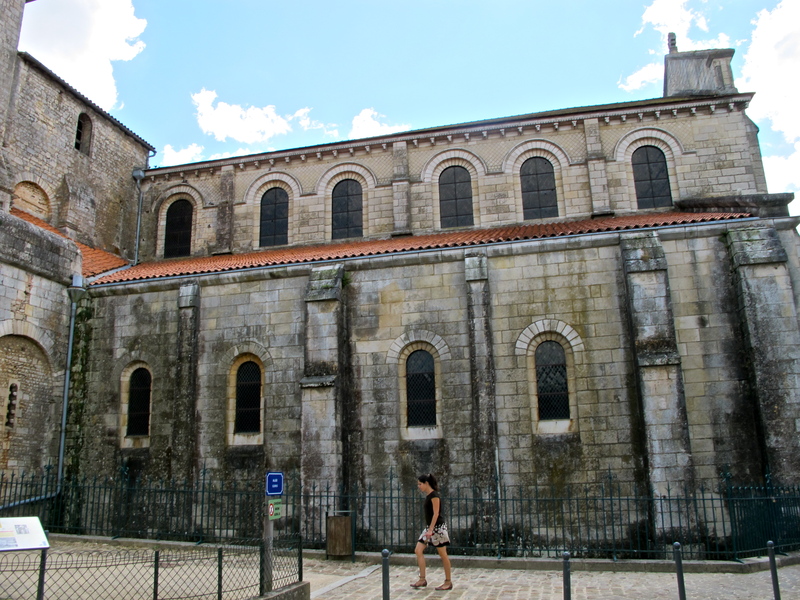 It has become a World Heritage Site as part of the “Routes to Santiago de Compostela,” which is located in northwest Spain, but pilgrims began their travels in France. Geoffrey Chaucer, in his Chaucer's Dream, describes Edward III's arrival with 1,100 ships to conquer France, his ill-fated third attempt. In this expedition, prior to the disastrous retreat: “the laurels of Poitiers were flung on the ground....” However., there does not appear to be a reference to Poitiers in Chaucer's Canterbury Tales. 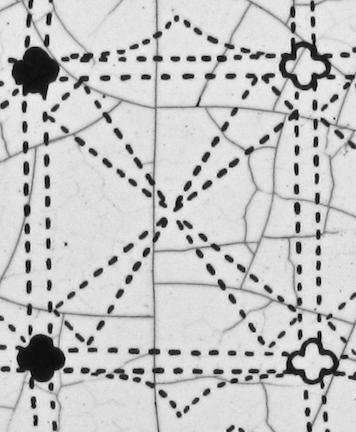 The plan, in which the solid members represent original construction, while the hollow members are reconstructions. 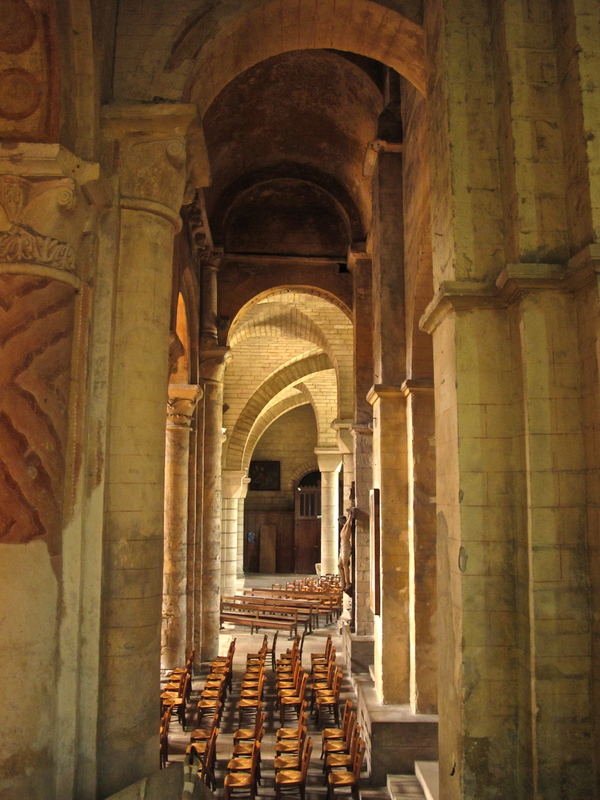 Note the very narrow aisles adjacent to the nave. Note also that the entrance is not due west, as in later day churches, but yjr altar and apse are oriented to the southeast. Since the objective in later churches was to orient themselves towards Jerusalem, this church, probably built on the foundations of the 4th century church, truly and accurately faces Jerusalem. 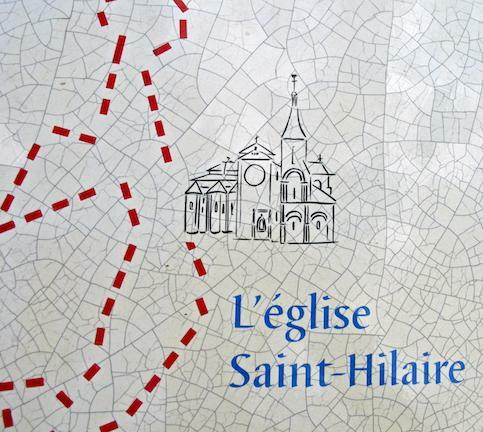 The so-called east/west orientation of later religious structures is not really as accurate as this little old church. The blow-up is of one of the so-called domes which, as stated above, are constructed by canting four sides of a bay, upwards. The photograph explains it all better, taken immediately upon entering, passing under the organ. 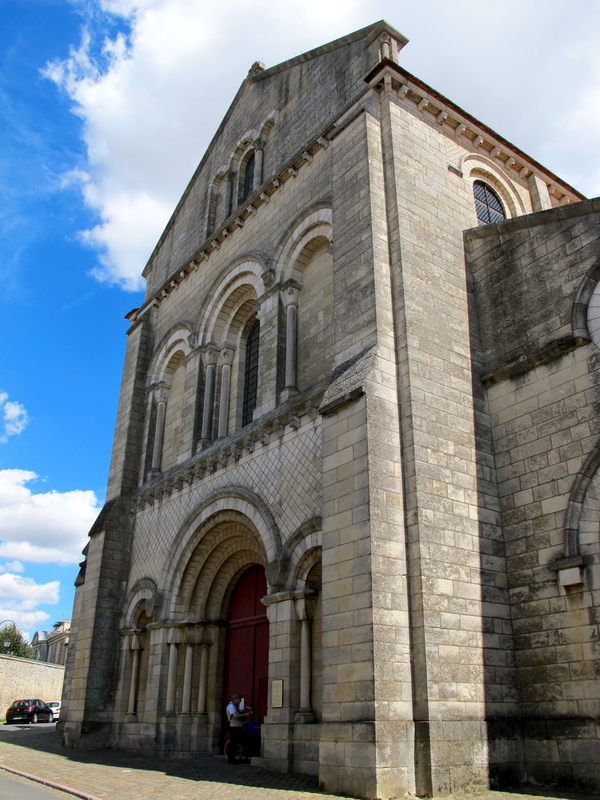 Back outside, we approach the northwest facade, and see that it is totally Romanesque, replete with semi-circular arches, although reconstructed in the 19th century. As mentioned above, the northwest end was shortened at the time of restoration, and one source claims the interior vaulting, for which the church has become rather famous, might have been built during this time of restoration. 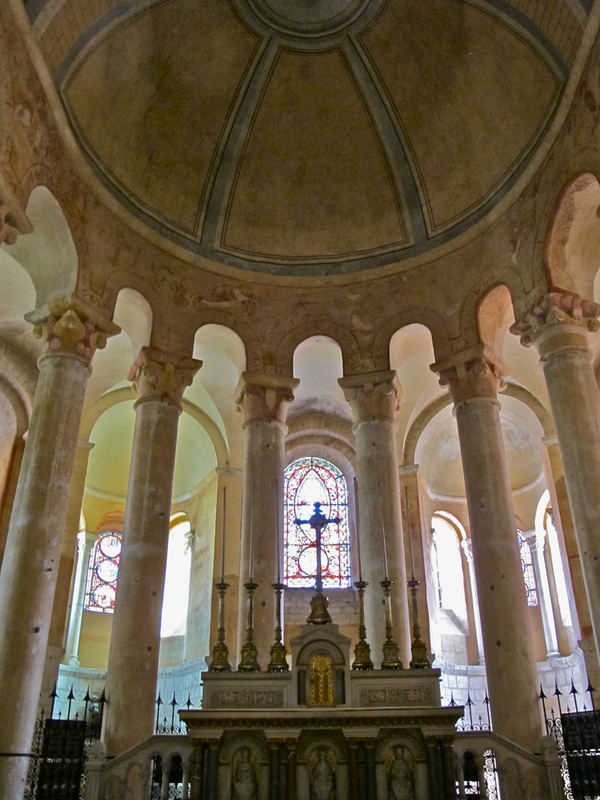 Several of the “domes,” however, appear to be in the original part of the church (see plan above). The comment is, quite frankly, disturbing, and not fully substantiated. Serious student research will be rewarded. The northeast side, showing a small tower. 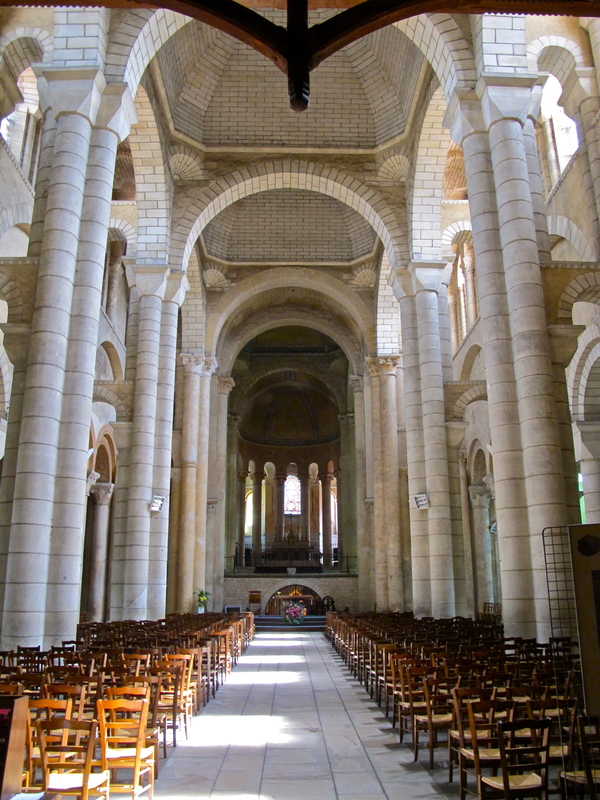 Semi-circular arches continue, the walls are plain, vertical buttressing supports the side aisle wall. 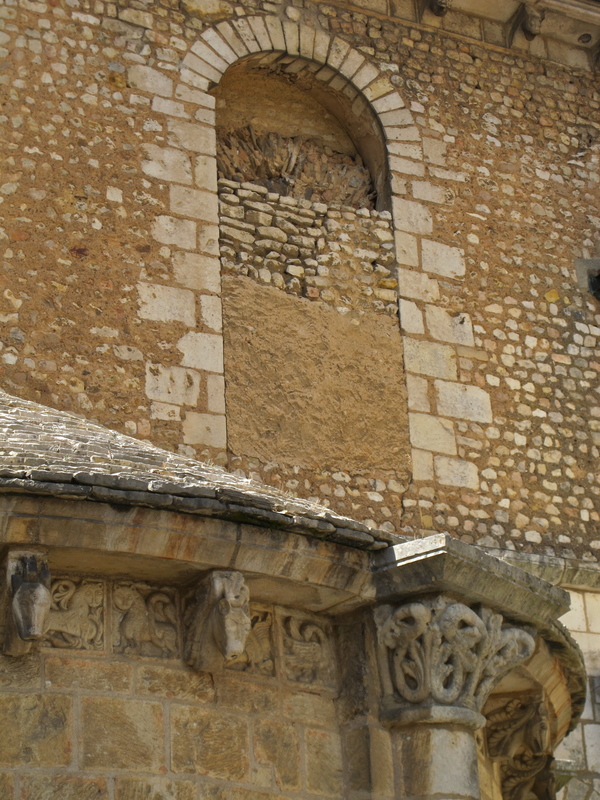 We can see a clerestory, but overall the openings, typical of the time, are minimal. 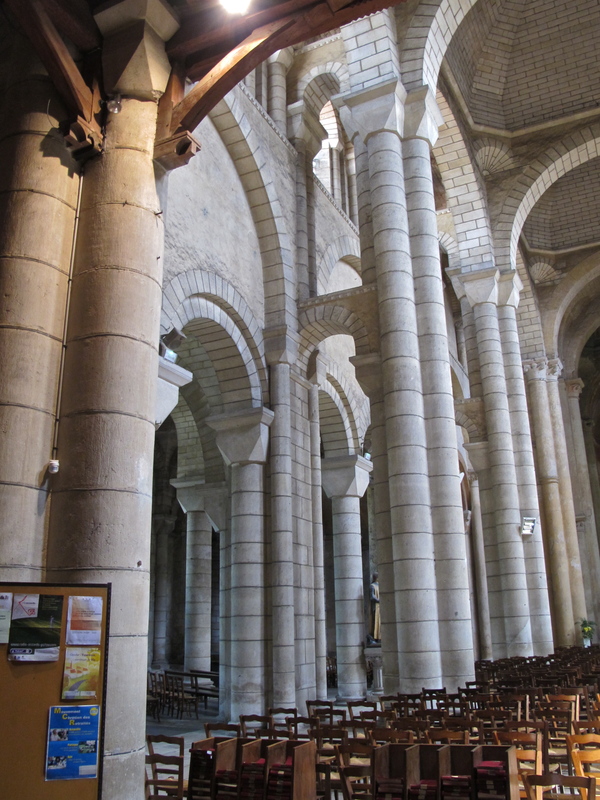 Also note that the buttressing of the clerestory area does not align with the side aisle buttresses, indicating construction at different times. 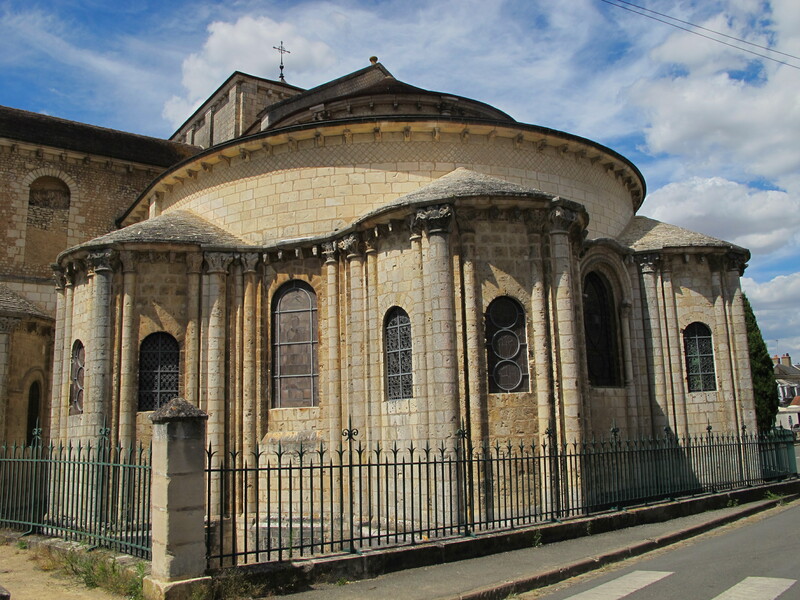 The chevet, composed of four radiating chapels (three being visible in this photo), is often described as being harmonious. 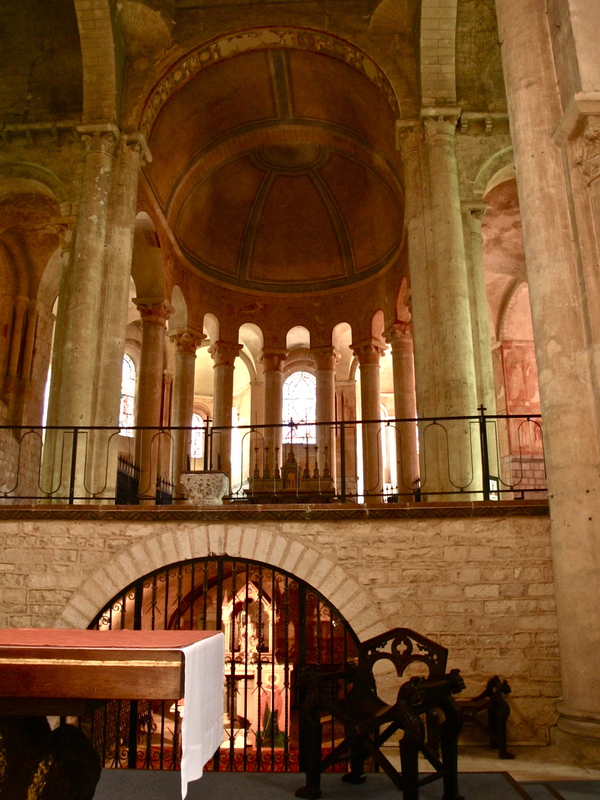 The apse actually sits atop the crypt, and since the ground slopes down from the front of the church, an additional level is seen here on the left. Note also the well to the right of center. Many churches were self sufficient, with regards things such as water, with adjacent monasteries becoming small villages unto themselves. Upon entering, we see the construction of very solid domical structures introduced after the fire of 1049. There are a total of eight. Obviously a wooden roof could no longer be tolerated, and improvisation resulted with the building of the dome-like stone vaults. 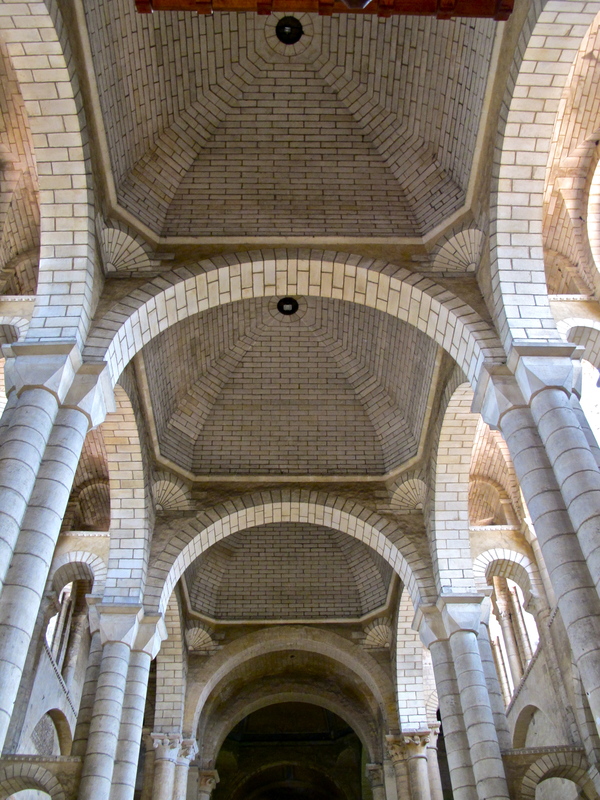 The three “domes” over the nave. The very awkward “domes” were actually four-sides canted towards each other, creating pockets of space overhead. 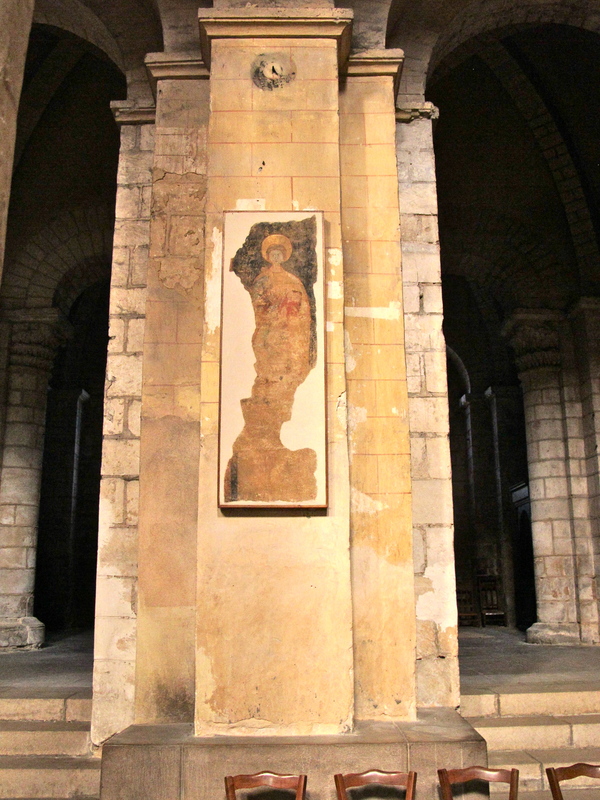 Arriving through the narthex, the view down the nave towards the altar is thus interrupted by negative upward “bulges” of space. Each pocket of space catches the eye’s attention, and there is no transition of visual movement towards the altar whatsoever. 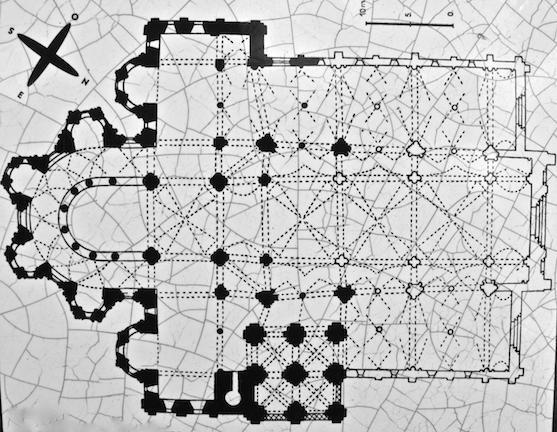 This was, however, a rather ingenious solution to the creation of stone vaults to replace flammable wooden coverings, and was a major step, albeit a unique one, towards the ultimate solution, the pointed arches of stone for which the Gothic is famous. It did do the job, but visual continuity was sacrificed. 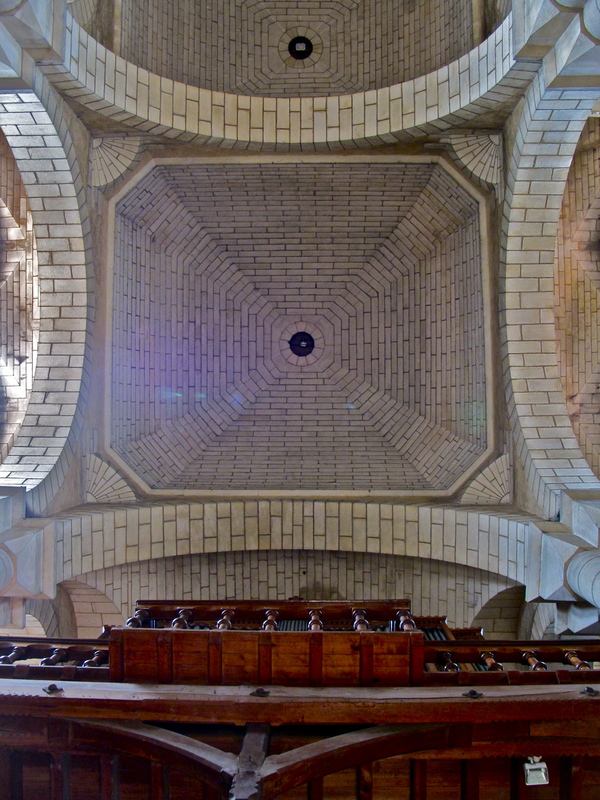 A look upwards over a side aisle reveals a twisted array of seeming improvisation, with what appears to be a leaping buttress. Obviously the masons were doing whatever was necessary to contain the structure. You can almost understand and appreciate what the masons must have endured in their quest for stability. 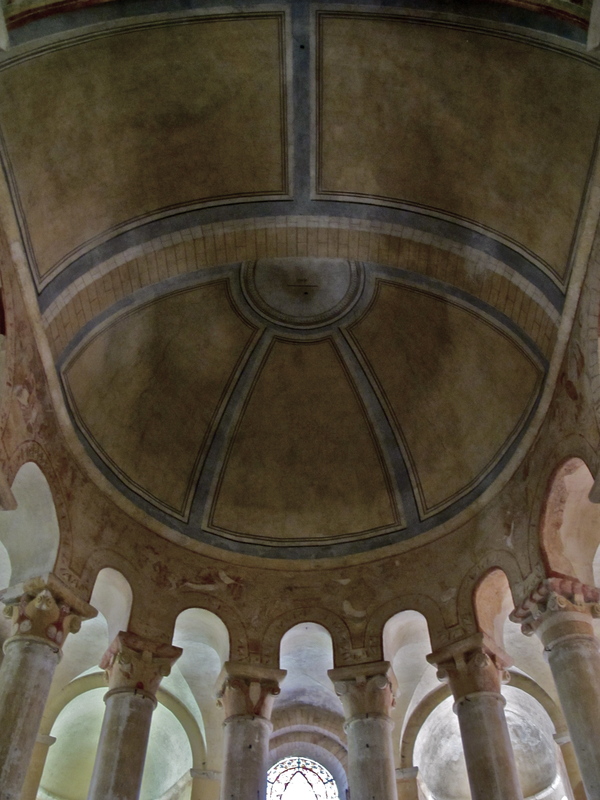 Another view shows capitals at different heights, arches soaring off into space, solid walls atop semi-circular arches, and on the left original painting of the stone. 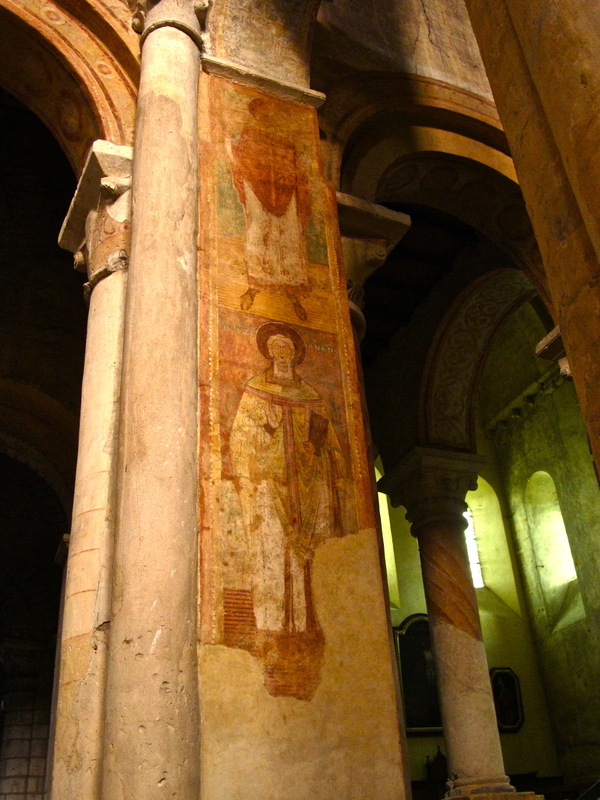 The choir contains some faded Romanesque frescoes, which point out the fact that so many churches were fully colored internally and, as we shall see in Amiens, externally as well. 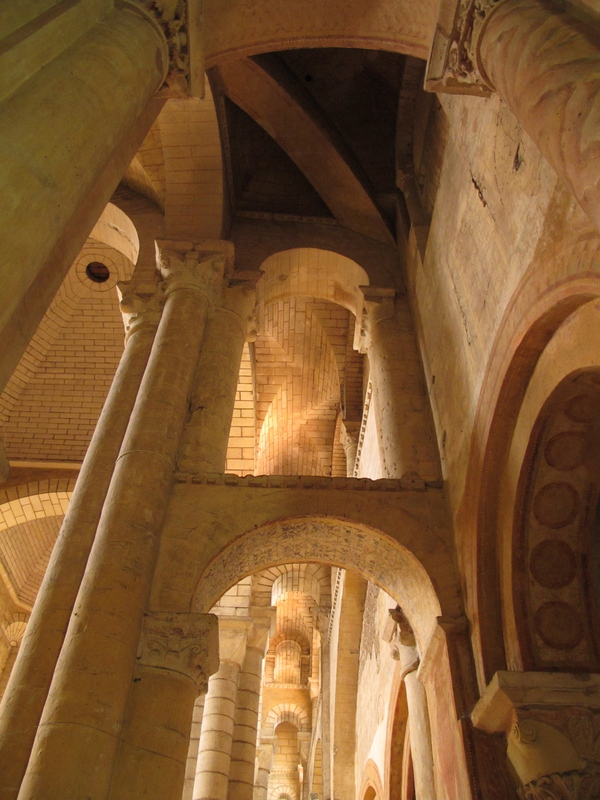 As mentioned above, an interesting feature is that while the ground on which the church is built slopes down to the apse, the altar and choir are raised, providing a view into the crypt below, sort of a split level idea. Looking up to the half dome over the altar, and part of the barrel vault which frames into that half dome. 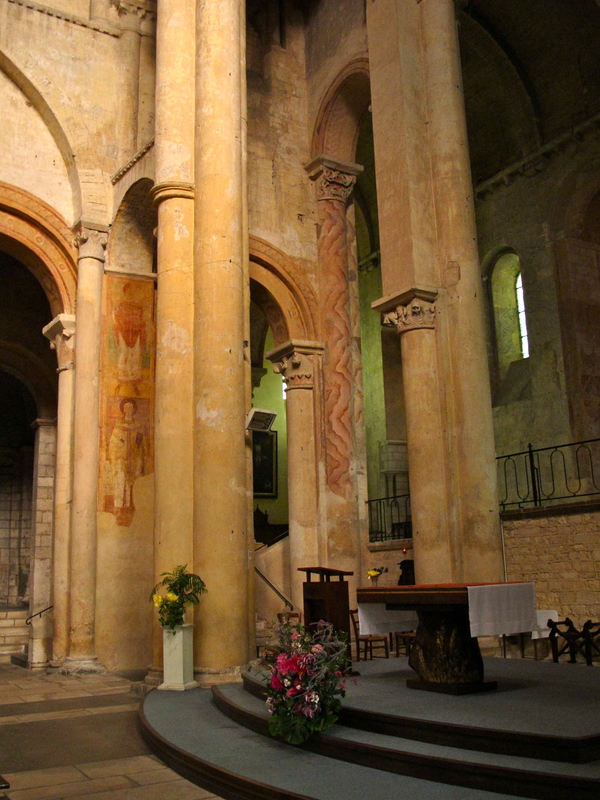 The columns shape a semi-circular colonnade forming the ambulatory in the apse. 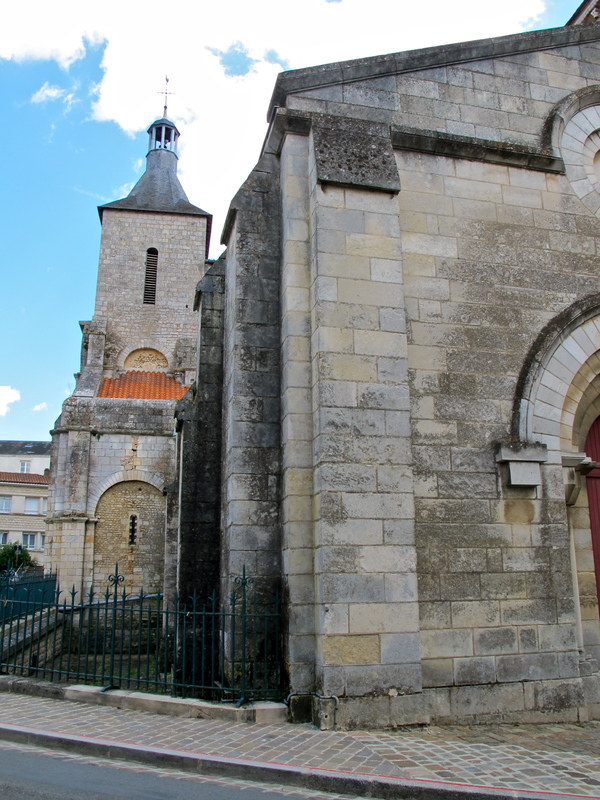 Now onto a second church in Poitiers equally significant in the development of the Romanesque.